NDN app requesting contents following Zipf-Mandelbrot Distbituion. Size of this type is 768 bytes (on a 64-bit architecture). Definition at line 51 of file ndn-consumer-zipf-mandelbrot.hpp. Default constructor Sets up randomized Number Generator (RNG) Note: m_seq of its parent class ConsumerCbr here is used to record the interest number. Definition at line 60 of file ndn-consumer-zipf-mandelbrot.cpp. Definition at line 69 of file ndn-consumer-zipf-mandelbrot.cpp. Definition at line 34 of file ndn-consumer-zipf-mandelbrot.cpp. Definition at line 126 of file ndn-consumer-zipf-mandelbrot.cpp. References GetNextSeq(), ns3::ndn::App::m_active, ns3::ndn::App::m_appLink, ns3::ndn::App::m_face, ns3::ndn::Consumer::m_interestName, ns3::ndn::Consumer::m_rand, ns3::ndn::Consumer::m_rtt, ns3::ndn::Consumer::m_seq, ns3::ndn::Consumer::m_seqMax, ns3::ndn::App::m_transmittedInterests, ns3::ndn::AppLinkService::onReceiveInterest(), and ScheduleNextPacket(). Definition at line 199 of file ndn-consumer-zipf-mandelbrot.cpp. Definition at line 224 of file ndn-consumer-zipf-mandelbrot.cpp. 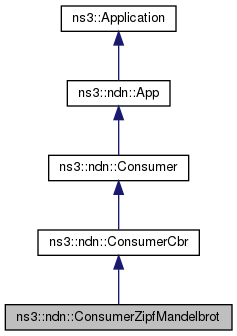 References ns3::ndn::ConsumerCbr::m_firstTime, ns3::ndn::ConsumerCbr::m_frequency, ns3::ndn::ConsumerCbr::m_random, ns3::ndn::Consumer::m_sendEvent, and SendPacket().